On Saturday, April 5th I headed out to work to teach a Girl Scout Try-It program. On the way there I passed boot lake and there were one or two muskrats at each little hole in the lake. It was like they had just come out of hibernation and were worshiping the sun. It was a very cool sight and there were lots of them on the lake. When I arrived at the nature center in the morning, the American robins were calling loudly and I saw the eastern phoebe singing while perched on the tripod for our weather station. Inside, I quickly worked to set up the program and noticed a female turkey at the feeders. Just behind her was a large make turkey strutting around with his feathers all fluffed up in full mating display. I sadly had to interrupt their little courtship to go outside to fill the feeders. I grabbed the camera on my way out but only managed to snap this shot of the male turkey taking evasive action against me. Part of the Try-It I was teaching was to watch for birds. Great! We all grabbed binoculars and hit the windows. We saw downy woodpeckers, hairy woodpeckers and red bellied woodpeckers. There were white breasted nuthatches and black capped chickadees. We saw a brown creeper and American goldfinches. 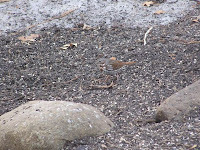 There was also a flock of slate colored dark eyed juncos (about 20). This has been an interesting flock. It showed up after the big snow last week. There have been a number of birds mixing in with the flock. On Saturday there was a fox sparrow (click picture to left for larger view of the fox sparrow) but also another bird I at first thought might be the American Tree Sparrow I had seen with them a few days earlier. It wasn't a tree sparrow. 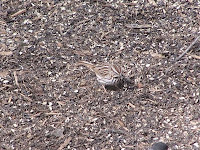 It was actually a song sparrow! Woo hoo, my first of the year. You can click this photo to enlarge it as well. We decided to go for a hike and take our binoculars with us. When we reached the prairie I had the kids listen for birds. Sure enough, there was some honking and a Canada Goose flew over. Within seconds I heard Sandhill Cranes and one flew right over our heads at tree top level. It was a fantastic view and the kids were fascinated by this enormous bird. That was just the first of many great views of Sandhills we got that morning as multiple birds made slow fly-bys. Just a little ways further, a large Turkey Vulture came over the rise in the prairie and showed of his flying technique. While we talked about it, one of the parents asked how I could tell it wasn't an eagle. Well, I explained, you usually only see bald eagles in Minnesota and (at least the adults) have white feathers on their heads and tail. It tends to stand out, well, like THAT I said as I pointed to the large bald eagle soaring 40 feet over our heads. Nice. We later spotted a kettle of bald eagles and when I looked more closely, circling up with them was a red-tailed hawk. We hiked up though the prairie and looped back when suddenly we were surrounded by swirling birds. Ah ha! The Tree Swallows are back! The second new bird of the day! Just for good measure, we also saw a crow before we left the prairie. That was all the birds we saw that morning but my afternoon group also saw a red-shouldered hawk. That made for a total of 20 different birds that day. I cleaned up and headed home. On the way home I spotted a female American Kestrel along Norell Ave (likely the mate of the male I saw a few days ago) and I saw a Great Blue Heron in the marsh on the corner of Norell and Co. Rd. 7. Carefully watching the ponds, I slammed on the brakes and pulled over on Co. Rd. 7 when I came upon the only open pond. There were 3 ducks in it. 2 males and one female. That could get ugly later! They were scaups. But which one? Lesser or Greater? They look almost identical but thanks to my trusty Sibley guide in my car I was able to tell after studying them for a while that they were lesser scaups. I had such a great view. It is times like this that really makes me want a good camera and lens. My old film camera is pretty good and I like my lens pretty well but I would have a hard time going back to film now. For one thing, it is so expensive to develop! To top off the day I saw some mallards, red-winged blackbirds and starlings so that put my final bird count for the day at 26 species (3 of which were new for the year) which isn't too shabby for this time of year! Wednesday morning (4/9/08) on my drive to work I saw lots of gulls flying about. They seemed to come back starting last Friday. I'm assuming they are ring-billed gulls but I will hold off on counting them until I can verify. At the marsh on the corner of Norell Ave and Co. Rd. 7 in Washington county I saw white in the now slightly open water and pulled over. Trumpeter swans! There were two of them. One was swimming and another was nestled back in the dried vegetation. Through my binoculars I also now could see that the open water was covered with ring necked ducks. That's two new species for the year at once. Nice! I pulled down the driveway at work and immediately noticed the water in the "peeper pond" directly across from the building was now open. Sure enough, there was something on the surface. I slowed down and raised up my binoculars. There were a couple of mallards but lots of wood ducks. They were beautiful! Oh, and what's that on the other side of the pond? Why a male hooded merganser! That's two more firsts of the year. Four new species in five minutes. On my way home I stopped at the same marsh on the corner of Norell and 7 and spotted a bufflehead in with the ring necks. I also saw a great egret in the marshy area next to Fleet Farm on Hwy 36. That was first of the year sightings for both of them.